Want to feel like Peter Pan in Neverland? 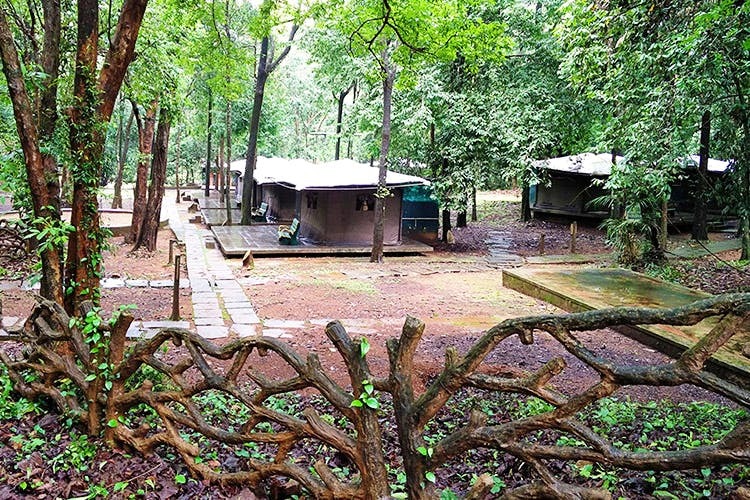 They can’t promise to keep you young, but at the Anejhari Butterfly Camp in Udupi, you can spend time exploring butterfly trails, trekking, nature walks and cool afternoons under the shade of the sanctuary by the river. I don’t know about you, but I find it hard to believe that anyone dislikes butterflies. So with that assumption, let me introduce you to the Mookambika Wildlife Sanctuary — home to the hidden Anejhari Butterfly Camp. With the river Souparnika gently gliding by and an army camouflage keeping it under wraps, it’s really one with nature. During the monsoon and the months after is the best time to visit, as it is butterfly heaven! Some of the butterflies that you may see here are the Tamil Lacewing, Plain Puffin, Malabar Tree Nymph, Paris Peacock, Grey Count, Red Helen, and Blue Oak Leaf. They have an in-house naturalist too to accompany you on your butterfly walk to take you through the wildlife and butterflies. On the whole Anejhari Butterfly Camp should definitely be on your weekend getaway list for it ticks the magical box! With no WiFi, television or anything to distract you, it is the perfect getaway to reconnect with your partner or family. Or just nature, really! Pick from eight tented cottages, or gather the entire gang and check into the dormitory with 14 beds! Since there’s an and 1 dormitory with 14 beds. The camp is almost fully run by solar power except for 90 minutes when the generator is switched on to charge phones and laptops. So for the sake of saving power and your sanity, we suggest you ditch the laptops. You’re in the middle of the forest! Go out and enjoy nature at its best! Apart from the butterfly park, head off to the Arisinagundi falls from the camp for a refreshing change. They don’t allow kids, so maybe leave them behind for a quick romantic getaway?